This card made with my S.E.I. die cuts has a fun little window and flower box. I coordinated the colors from the shutters and window box for a warmer summery look. Still using the My Mind’s Eye vintage Halloween papers and layering them on craft brown cardstock. I choose to embellish this card with a simple length of ribbon and bow then topped it off with a super tiny clothes pin and metal mailing tag. I had fun playing paper with heather yesterday…and watching reruns of The Finder (my new favorite show.) Then after work and making dinner I spent my evening on the tractor mowing the back 40 and watched D.H.Kenny and Jonathan throwing the football : ) Followed by a nice rest in the lawn chairs with a lager to watch the sunset. I do love this country life!! Feeling the need to get back into some shabbyer and vintagy colors so that’s the plan for Jane Day tomorrow. Wish me luck!! Good Morning Paper Peeps! 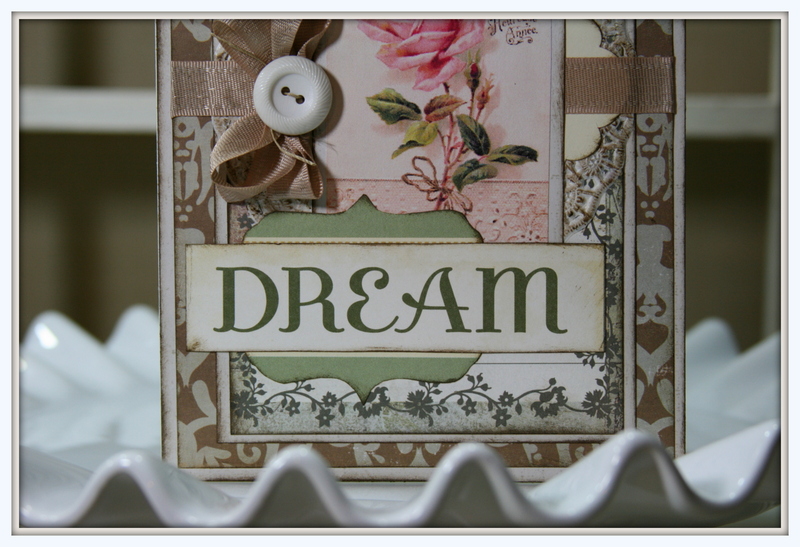 Today I am sharing with you another card made from the sweet little summery die cuts from S.E.I. Still using the same papers from My Mind’s Eye. I seem to be doing more layers lately. lol This time around I’m also layering the die cuts as well. Oh how I would love a sparkly front door and white picket fence in real life. We live on three acres out in the country so a fence is out of the question. The door I could maybe do something about : ) I added the little banner and some flowers here along with the ribbon and buttons. I finished off this card with a nice bow and layered and inked tags. Now if we could just get some summer weather. I used a great little box of die cuts from S.E.I. 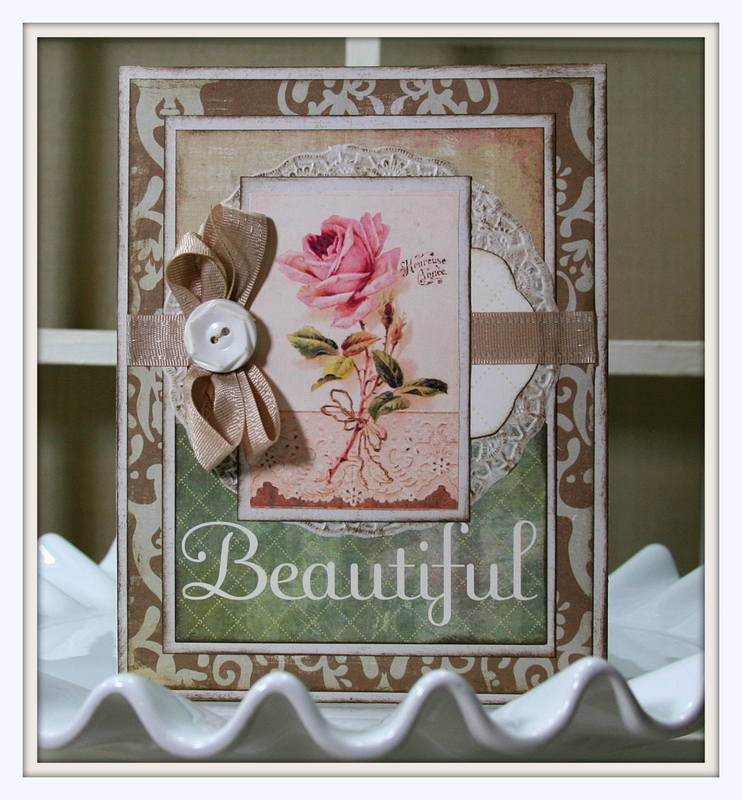 with a summery theme to create this sweet card. I added a mocha colored ribbon and bow and topped it off with a vintage button. There’s another of my favorite inked doilies and I think they help soften the edges and make a larger impact of the die cuts. I like a banner anywhere but they look especially good on a summer themed card don’t ya think? This one is made simply by trimming shapes from the scrap cardstock from the card. It’s inked to help define the edges, strung on a nice length of twine with super tiny bows and finished off with more of the vintage buttons. Don’t forget to sew through the button holes with a bit of coordinating string. I made some sweet little covered chipboard buttons on Jane Day this week and they found just the right project yesterday. I used vintage sheet music image from Graphic’s Fairy to create the banner. It has a border of the coordinating charcoal gray to help separate the patterns. The chipboard buttons were covered in small portions of an old wall paper image also from G.F. I adhered it to the button then covered in Glossy Accents from Tim Holtz. 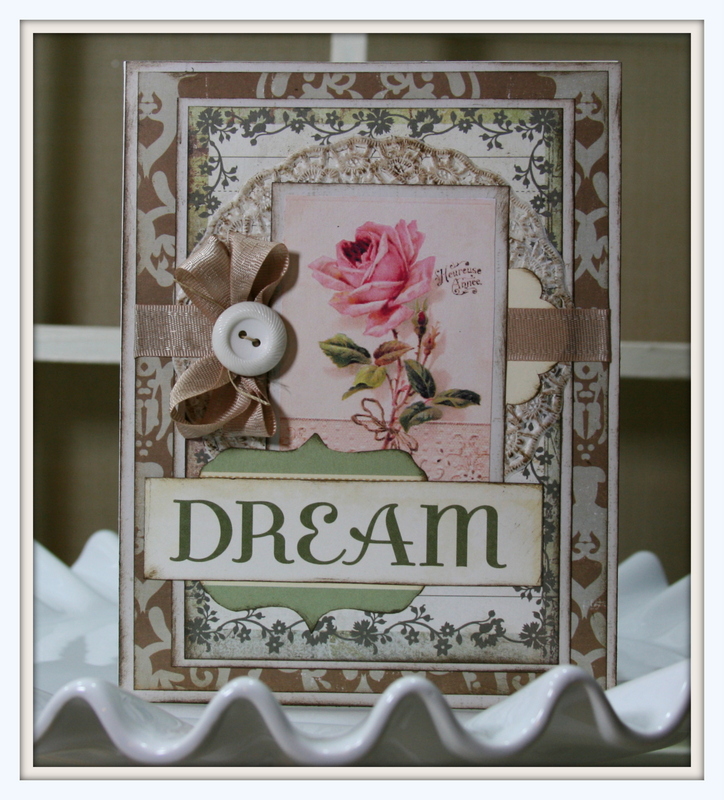 I used a vintage ticket also from Tim Holtz and a very cute little girl image. 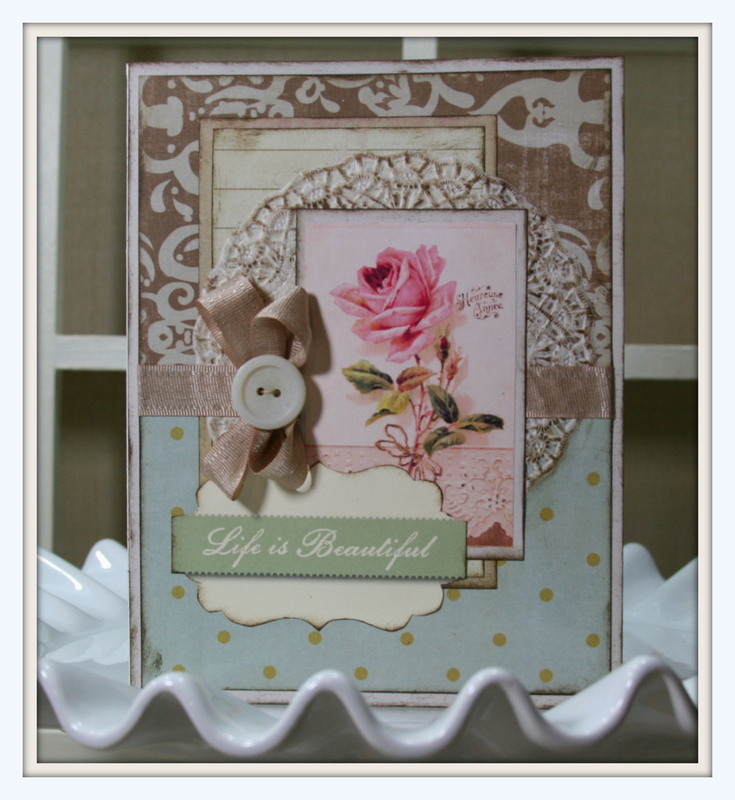 I created a faux button card and topped it of with a bow of mocha ribbon. Three is better!!! 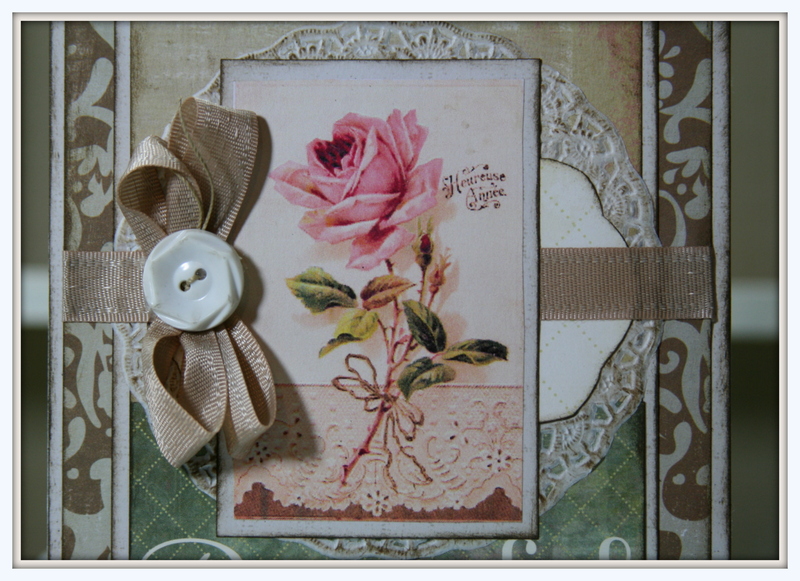 I just love this new vintage image Karen at Graphic’s Fairy posted this week of a lovely rose with lace trim. I wound up printing 8 of them intending to create some tags. But before I knew it…..they found their way onto cards. Seems they had a mind of their own. I used My Mind’s Eye papers and layered on a bit of Cosmo Cricket for the sentiment. An additional tag and doily and mocha colored trim here along with a vintage button. Pretty much the same elements here…just arranged differently gives me another sweet card. I layered the sentiment over a sage green element to pull the leaf color down to the corner. For this card I added a bit of the blue and gold dot pattern from yesterdays card. It’s a simpler arrangement . I was very pleased with myself for using up all the papers and not adding to the scrap pile. I will be trying this more often. I’ll be adding these to the selection of cards that will be great for Mother’s Day. I’ll be posting a special promotion for them in the shop starting Sunday. You know I gotta do something special for all us Moms!!! I started off on a pretty good roll of progress for Jane Day this week. I managed to check a few things off the list. Jane and Heather and I were chatting and gluing and glittering away.I created more of the fun paper packs, some pretty little chipboard buttons, cut out all my vintage images to be ready for crafting and actually finished this shabby sweet card. I used a lovely blue and gold dot paper and layered it on an off white cardstock with lot’s of ink. This very dimensional flower with typography print had a previous life on a different project but looks much better here : ) There’s a bit of chipboard and a vintage button. I created the scallop with a sheet music image from Graphic’s Fairy. I crinkled and inked it and I think it coordinates just perfectly. I added a doily and a Pink Paislee die cut. 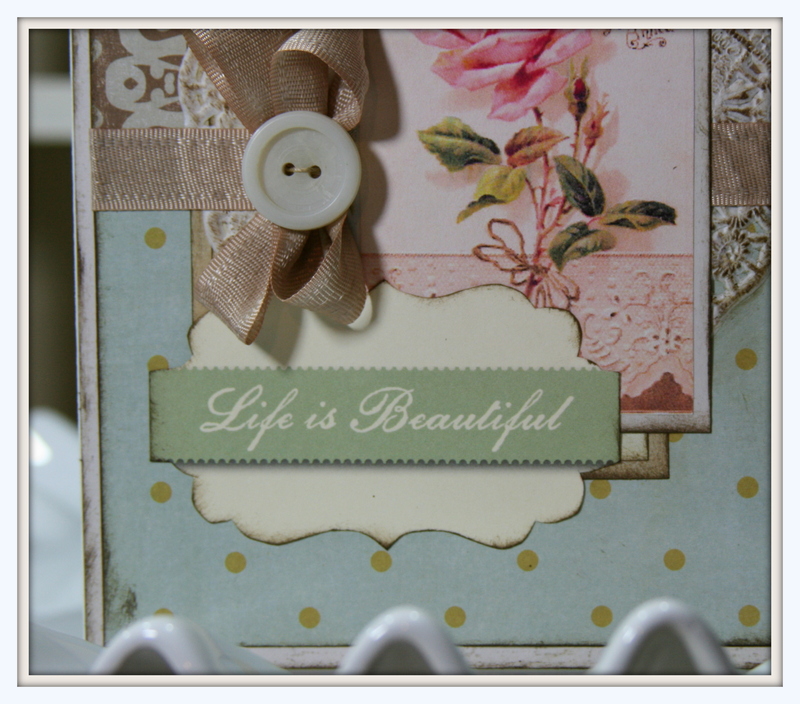 More is better with buttons…so I added a few more here along with a simple strip of mocha colored ribbon. It’s a very good idea to remove the boxes from Costco shortly after unpacking them and take them right to the recycling. Otherwise it may become a habitat for the local wildlife. This was quite a dramatic scene….sorry for the picture quality : ( I’m not so good a getting action shots. Lola has moved into her very own penthouse suite. Not much for amenities….but great location. We do not like our new neighbor Lily moving in downstairs. Oh I see you’re leaving. Very good vantage point for a sneak attack. Home sweet home at last….without the riff raff downstairs! Moral of the story???? Great boxes do not always make great neighbors : ) And don’t put off you’re recycling as it may cause a turf war.